This summer, a small group of teachers piloted Junior Solar Sprint at Virginia Commonwealth University (VCU), teaching students to build solar cars and introducing them to the science behind solar and renewable energy. As the program wrapped up, we realized that even more teachers and local engineer graduate students were eager to participate! Late this summer, 23 Metro Richmond Virginia teachers and engineering graduate students from 16 area schools engaged with a local youth program to bring Junior Solar Sprint to VCU on a much larger scale in a partnership called VCU RAMS Go Solar. As part of this program, teachers and future engineers attended a one-day professional development session earlier this month where they were introduced to the JSS program and learned how to engage with the students, linking the content to other important STEM knowledge. This group left the seminar excited and eager to jump in. The professional development session introduced everyone to the Army Educational Outreach Program (AEOP), the Technology Student Association (TSA) and Junior Solar Sprint (JSS). 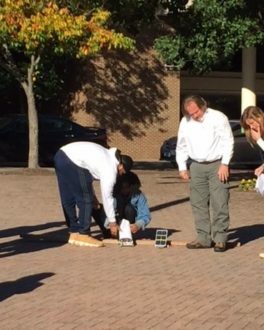 In addition to information sessions and rules for JSS events, the teachers tested different gear ratios and built their first solar vehicle. Everyone tested and modified their vehicles with the battery packs indoors but couldn’t wait to test out their vehicles outside. The final event of the day was a mock race outside using the solar panels. After the races, the teachers left with a toolkit of materials to aide their students in lessons focused on solar energy, gear ratios, and building solar cars. VCU RAMS Go Solar is a partnership between the School of Education and College of Engineering. As partners, we are developing professional development, planning support for teachers, engaging engineering students in helping the teachers and planning our culminating event. We are also recruiting local retired Army service members at VCU and in the region and active service members from local bases to support the teachers and students in the schools. This winter, we anticipate between 400 and 600 students will be working in teams of four to learn about solar power and designing and building a solar vehicle. Schools will hold events to determine the two teams that will visit VCU in late spring 2019 for our first Junior Solar Sprint Challenge Event. Two teams of students from each school will come to compete and showcase their cars. 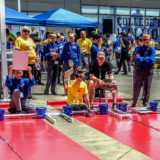 When not competing, students will participate in other engineering events, meet engineering students and faculty and tour the campus. Events for parents will highlight how to prepare for college and opportunities post high school. We are excited about our first event and building this partnership with schools. We look forward to hearing and seeing the excitement at each school. Check back with us at the end of April 2019 to learn more about the success of the event.